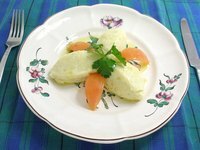 Cod fish, a dense fish with white flesh, can be cooked with almost any type of cooking method. Cod are typically flash-frozen and sold in grocery stores, but you can also buy the fish fresh along the Atlantic coastline. Cod fish has a mild flavor. Seasonings such as basil, tarragon, dill, thyme and ginger go well with cod. Black pepper or garlic are good choices, too. The seasonings will stick to the meat and make the fish taste flavorful. Thaw frozen cod fish in the refrigerator overnight. Rinse the cod fish off with cold water. Dry the fish with paper towels. Place the cod fish fillets on a cutting board. Brush both sides of the cod fish with melted butter. Squeeze a lemon wedge over the fillets. Apply plenty of dry seasonings to both sides of the cod fish. Cook the cod fish with your preferred cooking method. You can bake, broil, fry, grill or saute the fish.